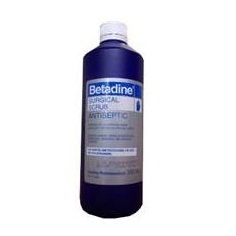 General Betadine Surgical scrub antiseptic is bacterial fungicidal and virucidal cleanser For hospital and professional use only Not for repackaging Dosage Use undiluted. Pre Operative washing by operating personnel. Wet hands with water. Pour about 3.5 mls 1 stroke of the plastic pump on the palm of the hand and spread over both hands without adding more water rub the scrub thoroughly over all ares for a minimum of 2 minutes a brush should be used at least one particullarly during the first pre-operating wash of the day clean thoroughly under finger nails add a little water and develop copious suds, rinse thoroughly under running water. Pre operative use on patients after the skin area is shaved wet with water apply betadine surgical scrub and scrub thoroughly for a minimum of 2 minutes developing a lather rinse off with water and pat dry with a sterile towel the area may then be prepped with betadine antiseptic solutuon prior to surgical procedures.